It’s a story that may change the way you shop. We show you a price switch you may not be aware is happening and tell you how to get around it. GOLDEN VALLEY, Minn. — After a KARE 11 investigation and because of your feedback, changes are coming to the Target app. Watch the below video or if you're on the app, click here. 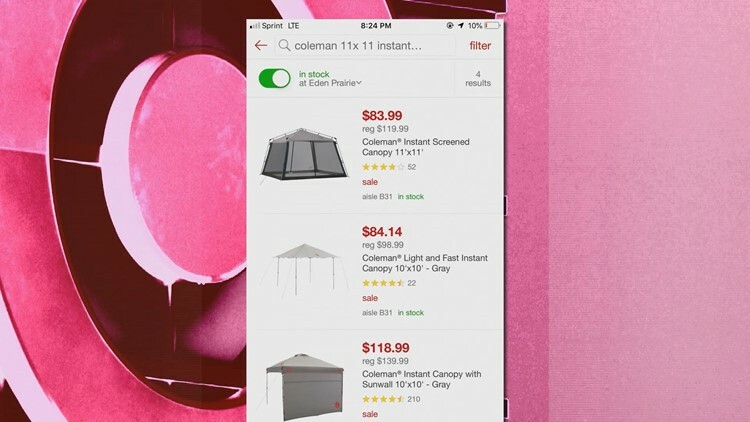 When you use store apps like Target’s, you expect that’s where you will find the best deals. After all, you're giving them access to your shopping habits and history, even your location. But what if you weren't actually getting the lowest prices on those apps? In a two-month investigation, that began with a concern from a viewer, KARE 11 found Target’s app changes its prices on certain items depending on if you are inside or outside of the store. Our list of 10 items was a total of $262 cheaper in the back of the parking lot on the app with no indication that the prices had changed. Even if you scan the bar codes of the products on the shelves, which Target suggests customers do to see Cartwheel coupon offers on the app, the app gives no indication that certain prices were far cheaper at Target.com. In an emailed statement from Target, the company said "The Target app shows in-store pricing while in store, and online pricing while on the go. If a guest finds any item for a lower price across any of the ways they can shop Target, we'll price match it." University of Minnesota Carlson School of Management Marketing Professor George John believes there's a little more going on than that. How does Target know when you are inside the store? When you download the Target app, it asks you if it can access your location. Enabling this allows you to see stores near you, and when you are inside a store it will show you where to go for specific items and deals. What Target does not clearly tell customers is it appears this function also triggers price changes as you approach the store. Miranda Artz, an avid Target shopper, first noticed this while buying an electric shaver last spring. But when she walked out to her car, she noticed the product on her Target app now read $69.99. A screenshot of a customer's Target App. A canopy was listed at $83.99 at 8:24 p.m., and the price rose to $119.99 after the customer entered Target. She got out of the car and went back inside the store. “By the time I had got to the front of the line with customer service, the app had gone back to $99.99,” said Artz. She went back to her car again, and the price on the app switched again. This time she took a screenshot on her phone, showed it to customer service and received the discounted price. She says the same thing happened a few weeks later when the price of a tent she saw on the app went up $40 dollars when she walked into the store. “I think it's a little deceptive,” said Artz. Customers can still go to Target.com inside the store to see online pricing but buyer beware... a Google search might not get you to the price you’re looking for. For instance, a new Heyday brand iPhone case is listed at $19.99 in the store, and if you Google the same case and Target, the search results show the product listed for $14.99. But when you click on that product expecting it to take you to Target.com, the Target app opens automatically showing, again, the in-store price of $19.99. Artz said there was a time when Target’s app would alert you to a lower online price, if available, when you scanned a product in store. She said that seemed to change last spring. Target would not confirm if it used to do this, nor would it confirm when its in-store vs. online price switches started taking effect on the app. “You should meet the expectations of the customer. If the customer believes they are getting an in-store price, say it is the in-store price,” said John. There is one quick and easy way to ensure your Target app does not switch any prices when you walk into the store. In the app, click on your name icon in the bottom right of the screen and scroll down to “app settings.” Click “Location” and switch it to “Never.” This switch will no longer permit the app to see your geolocation, and in this setting the app will always show the online prices of products, even if you are standing inside the store. KARE 11 performed the same app tests at Macy’s, Best Buy and Walmart. All of these retailers’ apps ask permission to know your location, but our results show none of them alter prices on the app when you walk inside the store. Best Buy’s app goes into “store mode” when you enter the store, offering certain features around the inventory, but the spokesperson said the app does not switch prices by geolocation. We did not receive comments from Macy’s or Walmart.